Toronto wedding photography is a very competitive arena and for an artist to be successful, he needs to stand about the crowd. At this Liberty Grand wedding we pushed ourselves and delivered stunning imagery. One of my first lessons as a professional photographer was to deliver a mix of photojournalistic images and what they call epic pictures. This first spread of the wedding album portrays the couple having an intimate moment just outside the main entrance during a Liberty Grand wedding. In order to deliver a wide variety of photographs, during my consultation with the couple, I advise them to allocate time for a sunset photo shoot. Also, during the reception I ask the couple to join me in my second wedding photographer for a quick night creative portraits session. While I realize that the wedding day is a busy one and couples are on a tight schedule, it is very important to take a few moments and create a few signature portraits they will cherish for the rest of their lives. After all, in a few years everybody remembers their special day when they look their photographs. As such, besides the candid images a capture during the couple's preparation, the wedding ceremony and dinner, I also want to include in their album a series of double spread images. The setup for this particular image took about three minutes. In fact, I promised the couple that the whole photo shoot will last no longer than 10 minutes. They agreed and we created a few stunning wedding portraits. The couple chose to get married at the Liberty Grand Entertainment Complex in downtown Toronto as they love the elegance of the architecture and the professionalism of the staff. I particularly like the arched windows, which left in plenty of light and are perfect for wedding day portraits or, in the unfortunate event that it rains any cannot gets married in the courtyard. We were very lucky because despite the summer being very rainy, on the big day we had perfect weather. During the cocktail hour we left the wedding party to take care of the guests and took a few sunset photographs in front of the dome adjacent to the Renaissance room. For the bride and groom looking to get married at Liberty Grand I highly recommend to book the Renaissance room. The Centennial room is the mirror version of the Renaissance room. However, the Renaissance dome is washed in a beautiful light at sunset. As light is the main ingredient in wedding photography, sunset photographs captured on the west side of the complex look breathtaking. To achieve this image in the few moments and given on the wedding day, it takes a lot of practice and speed. During the reception, I asked the second wedding photographer to join me on a quick tour to scout the best spots night portraiture. When I found a few spots that I loved, I discussed the poses with my second shooter and then we brought the couple along. We also asked a few members of the bridal party, was specifically to bridesmaids to join us so that they can keep an eye on the brides wedding dress. It is always good to ask members of the wedding party to join you when you do a photo shoot in case you encounter guests were not willing to cooperate. In those situations, the bridesmaids can have a chat with the guests so the photographer does not get into arguments on the special day. One could also ask the wedding planner to intervene when necessary. The truth is this is one of the most beautiful wedding venue in downtown Toronto. I particularly love the professionalism of the staff. Also the food aficionados will be happy to hear that the service and the food are top-notch. Probably mentioned that in the past I judged National photography competitions and honestly I saw very few wedding photographers in Canada and in the GTA who are able to create such an outstanding image. 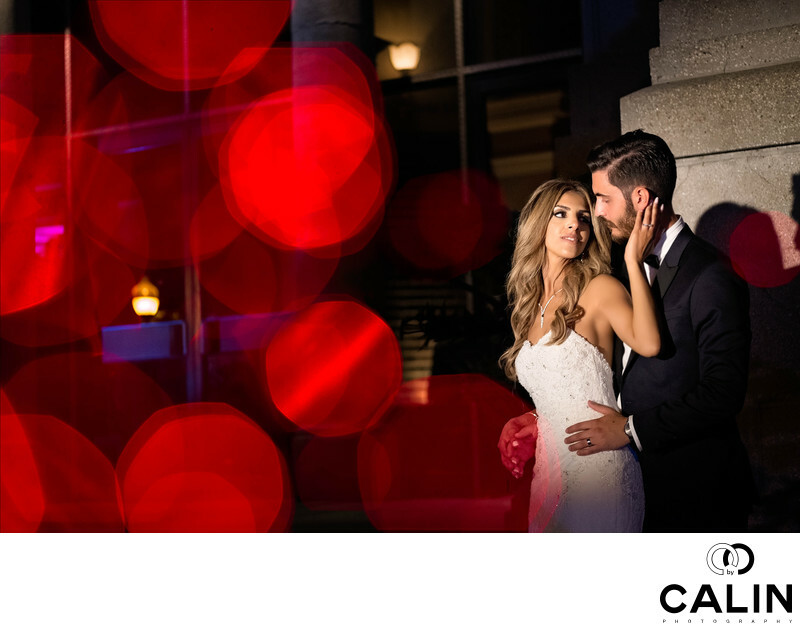 The striking element in this picture is the huge globes of red light symbolizing the love between the bride and groom. As a Toronto wedding photographer, I always try to be different from my peers. Creating the foreground bokeh not only gives the wedding photographs a certain romantic feel but also makes our photography stand out. This is the reason why many brides in the Greater Toronto Area hire us to document their big day.